Like most, I know several people who have or have had cancer. Chrissy, Kristine, Margaret, Cindy, Bob, Helen, just to name a few. As an employee at the Y, I met dozens of cancer survivors who participated in the Livestrong at the Y program. But it really hit close to home a couple years ago. A bump on the head led a doctor to discover that my Dad had Gall Bladder cancer. An otherwise very healthy 89 year old, WWII Purple Heart recipient, he had always said that he planned to live to 100. Unfortunately, all those years of cigar smoking and the nightly Black Russian (or two) had secretly attacked his body and he lost the battle just a few short weeks later. Though I feel like I was ripped off of 11 more years with “Dear Old Dad”, I am grateful for the time and the experiences that we shared together. After Mom died from Alzheimer’s, Dad made it a point to spend time with his grandchildren and great-grandchildren and extended “grandkids”. He came to birthday parties and recitals. He made annual trips to Pennsylvania to spend time with my oldest brother, his children and grandchildren. 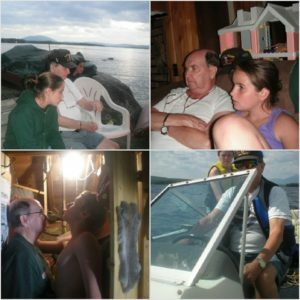 And he would drive himself 7 hours to my sister’s cottage in Maine to spend time with my family, drive himself home and then drive back up a couple weeks later when my sister’s children and grandchildren were there. He was amazing. So, though my Dad and so many others have lost the fight against cancer, there have been so many that have been given more time or been able to beat it. It is for all of them that I Relay.